I got into a long conversation about adventures the other day. I was chatting with a friend–a friend who happens to fit my very definition of an “adventurous spirit.” She loves trying new things, taking calculated risks, traveling to new and interesting places. Her curiosity and thirst for new experience is clear in everything she does, whether it’s flying up into an inversion she’s never tried in yoga or tasting an exotic ingredient at a restaurant. Me, I’m a different story. It took me years and years–not to mention many piles of props–to cautiously raise my feet into a headstand. I’m slow to warm up to new flavors and ingredients, which is something of a liability when recipe development is part of your job. I haven’t seen much of the world, and when I do travel, I tend to plan it all out carefully. Intrepid isn’t exactly a word I’d use to describe myself. This isn’t a bad thing, of course: we all have our predispositions, and my attachment to home and hearth is as much a part of my character as my friend’s daring is a part of hers. But as my friend and I were speaking, it occurred to me that I’ve lately been even less intrepid than usual. This gives me something to think about, because some of my most valuable life experiences came about when I was willing to set some cautiousness aside. My post-bacc is a good example: it was a professional risk, a leap of faith, and a true adventure, at least for someone like me. It involved exploring a new place–this after many years of being tethered to one zipcode–and taking a chance on a fledgling relationship. Nothing went as planned, but that wasn’t ultimately the point. So many friendships, lessons, and memories emerged from those years, and I’d never have met Steven had I not moved to D.C. I can think of other examples, including the risk-taking that defined ED recovery, along with the culinary exploration that comes along with going vegan, or changing one’s diet in any substantive way. It doesn’t surprise me that I’ve been particularly guarded in the last year or so. Venturing into unknowns doesn’t feel like much of a possibility when you’re struggling to keep equilibrium from day to day. But life is cyclical, and seasons change. Lately I’ve been thinking about how I’d like to start being just a little more adventurous again, even if that intention shows up in small ways. Dad was always going out on a limb, befriending people who didn’t necessarily seem to want new friends, trespassing on private property, pushing the boundaries of acceptable behavior in quest of adventure. His philosophy was that you don’t need money or plans, only a willingness to be present in the moment and to go where inspiration takes you. If you don’t, you’ll miss the entire point of being alive. Dad’s unorthodox and sometimes embarrassing friendliness got him, and us, into trouble now and then. Some people didn’t take kindly to probing questions. Others found his puppy-dog openness suspect or unsophisticated. But his innate, bottomless curiosity about the world also taught his four daughters to be open to new experiences and comfortable with improvisation. Even now, in his late 70s, he lives each day with a kind of purposeful recklessness, asking provocative questions and seeking new experiences in the belief that he can break through to something better, more meaningful, more satisfying. We all have gifts or special qualities that can, at certain moments or when taken to extreme, serve as handicaps. I’m sure this is true of unquenchable curiosity, just as it’s true of being especially deliberate. But I was touched by Kline’s deep appreciation of her father’s way of being, and it’s clear that she and her siblings learned a lot from bearing witness to his explorations. That’s one of this week’s reads, along with a few other memorable articles. But first, some of the recipes I’ve been pinning and pining after this week. 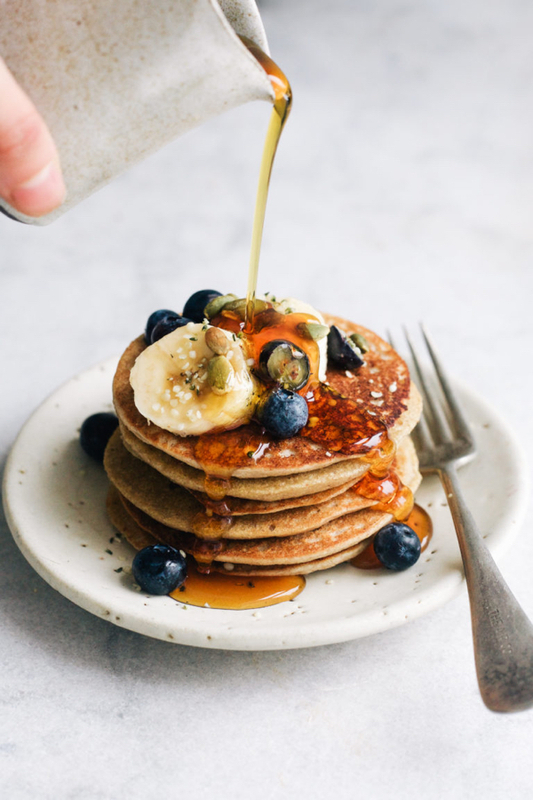 I’m feeling super inspired by cozy breakfast fare this week, starting with Sophie’s super simple blender buckwheat banana pancakes. 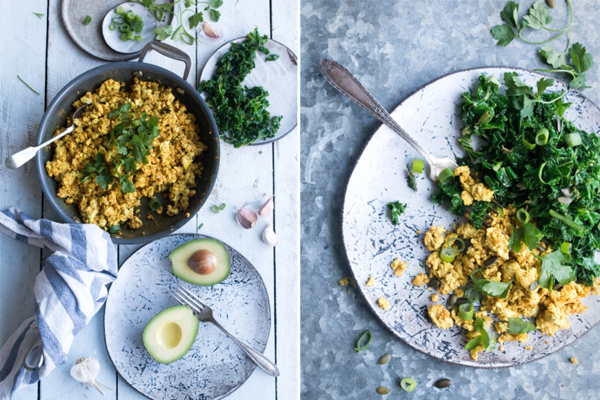 I can never get enough tofu scramble for breakfast, and Kimberly’s tofu scramble with garlicky kale will be my next batch. 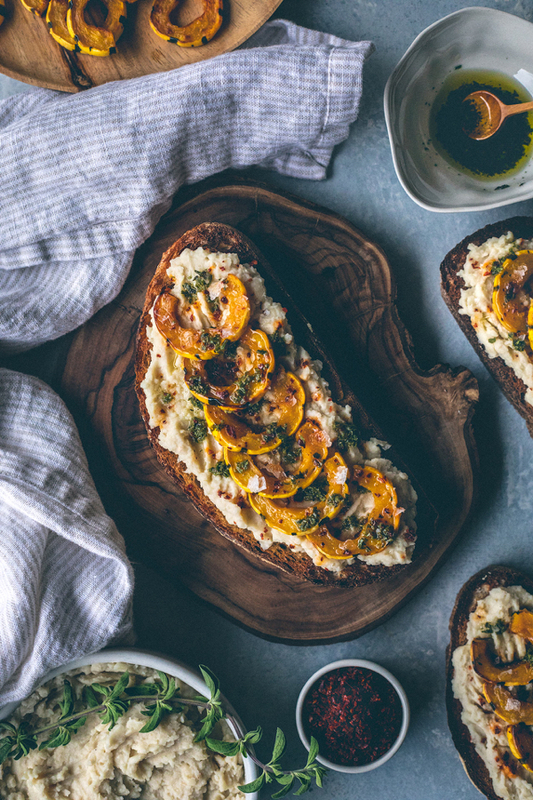 I’ve really fallen in love with delicata squash this winter–it’s just so easy to prepare, and I love its tender sweetness–so I was really excited to see these lovely squash and butter bean tartines over at Honestly Yum. What a delicious idea for an easy lunch or appetizer. 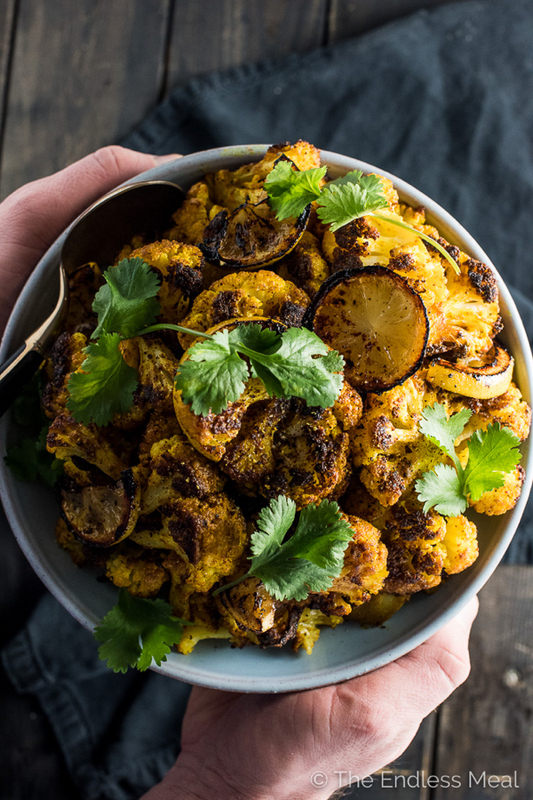 I can never get enough ideas for roasted cauliflower–it’s one of the vegetables we eat most often in the winter here at home–and right now I’ve got my eye on Kristen’s turmeric roasted cauliflower. I love the idea of adding thinly sliced lemon to the sheet pan! 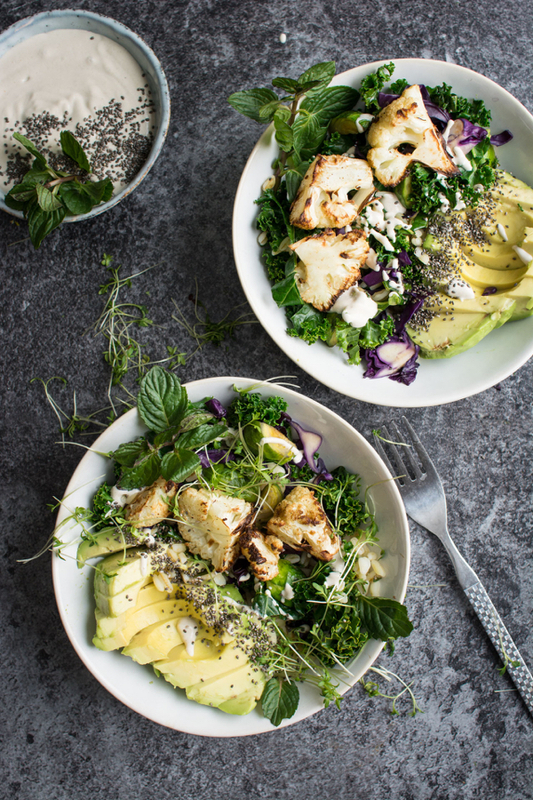 …and if you need an easy, healthy way to serve your roasted cauliflower, check out Lauren’s roasted cauliflower bowls with tahini sauce. Simple and beautiful. 1. A few new years ago, I meditated a bit on the idea that before we speak, it’s helpful to filter our words through three questions: is it kind, is it necessary, and is it true? These are still questions that I pose to myself, especially before I voice an opinion or an idea that might be hurtful or difficult to hear. In this post, RD Emily Fonnesbeck applies the same questions to the words one speaks to oneself internally–what we’ve been calling “self-talk” in my counseling class. It’s a good exercise, because it brings to light the discrepancy that often exists between the way we treat others and the way we treat ourselves. 2. Also on the topic of compassionate self-talk, I like Jennifer Rollin’s ideas for supporting a loved one who is communicating body dissatisfaction. 3. This excerpt from Christine Hyung-Oak Lee’s new memoir on losing her short-term memory (after suffering a stroke at the age of 33) is pretty incredible. Lee’s vivid and evocative portrait of day-to-day life without the use of short-term memory taught me a lot about how memory functions and enables us to manage our everyday patterns and routines. 4. An interesting perspective on the idea of willpower. Psychiatrist Carl Erik Fisher offers a challenge to the idea that willpower is a discreet, limited resource that human beings either do or don’t possess. 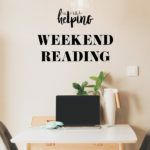 This notion, he suggests, has its origins in certain moralistic schools of thought about what governs human behavior, and it may have outlived its usefulness as a way of looking at issues like addiction. 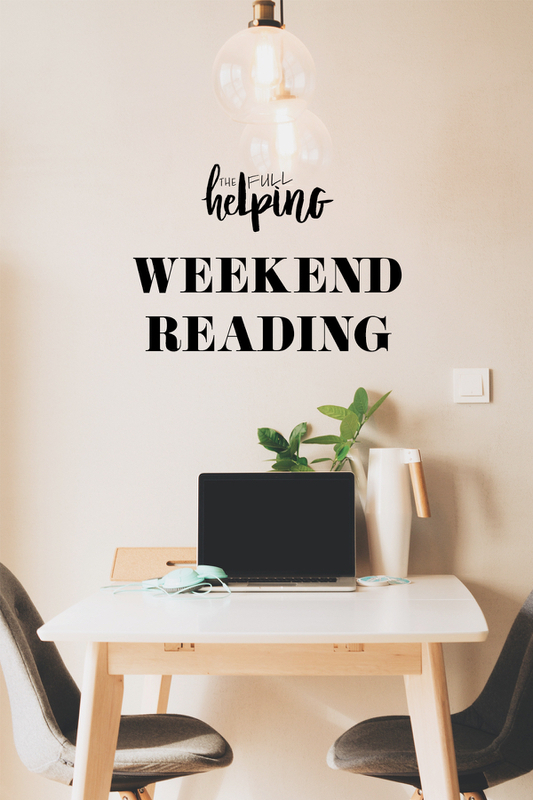 It’s a complex topic, but the article resonated. I see often how discouraging the idea of innate willpower can be; “I guess I just don’t have enough willpower,” clients have often exclaimed to me with exasperation. The idea of willpower as something that one either does or doesn’t possess can create a sense of hopelessness or being broken, and it can prevent us from examining the forces in our lives that stand in the way of change. In this way, I can certainly see the value of a fresh perspective–one that’s less tainted with self-blame. 5. Finally, Christina Bake Kline’s sweet essay on her father and his adventurous spirit. Sending everyone good thoughts on this Sunday. I feel overwhelmed sometimes by the conflicting urges in my head – I’m a planner but also have the urge to take big risks which is very confusing!! To your point, I think it’s about finding the balance of what’s going to work for me and how to take managed risks. 🙂 I love that NY Times article – what a great inspiration to be a little more spontaneous! Also I made your chai spiced carrot muffins this morning and they are delightful! Such a surprise! Really didn’t expect this! Thank you for including the scramble. Been enjoying your book so much. I always wait for these posts impatiently every week. Thanks Gena! The articles on speaking to oneself and on willpower were particularly relevant to me. And the food is just yummy, thanks for sharing!